Figure: Partners and measurement sites in GUAN. Colour coding of measurement sites: Alpine (light blue), rural background (green), urban background (orange), traffic (red). particle number size distributions, measured by custom-built SMPS, TDMPS, or TSMPS. We see GUAN as part of the European observation network ACTRIS where experimental methods are homogenised and data made available to public and research users. Parts of the GUAN data can be accessed on EBAS under the given data policy. German Federal Environment Ministry (BMU) grant F&E 370343200 (German title: "Erfassung der Zahl feiner und ultrafeiner Partikel in der Außenluft"), 2008-2010. 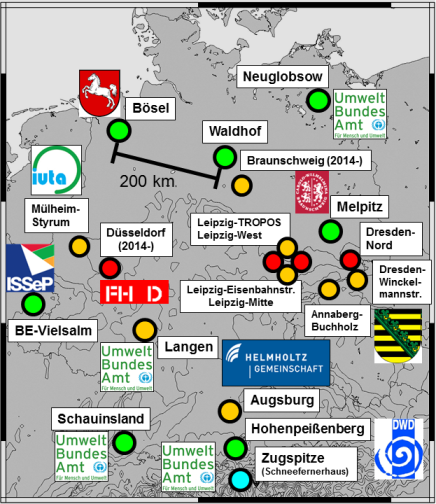 German Federal Environment Ministry (BMU) grant F&E 371143232 (German title: "Trendanalysen gesundheitsgefährdender Fein- und Ultrafeinstaubfraktionen unter Nutzung der im German Ultrafine Aerosol Network (GUAN) ermittelten Immissionsdaten durch Fortführung und Interpretation der Messreihen"), 2012-2014. Nordmann, S., W. Birmili, K. Weinhold, K. Müller, G. Spindler, and A. Wiedensohler:, Measurements of the mass absorption cross section of atmospheric soot particles using Raman spectroscopy. J. Geophys. Res. Atmos., 118, 12075–12085, doi:10.1002/2013JD020021, 2013. Rückerl, R., A. Schneider, S. Breitner, J. Cyrys and A. Peters: Health effects of particulate air pollution: A review of epidemiological evidence. Inhalation Toxicology, 23(10): 555–592, 2011. Click here to see the full list of GUAN References and research results. Last changes: Jan 9, 2019.